In the far Southwest of Scotland on a peninsula washed by the Gulf Stream, Logan's mild climate allows a fine collection of exotic plants to grow out-of-doors. Come along and see these beautiful plants which can be found in few other gardens in Britain. Woodland Garden - Stroll through glorious glades of eucalypts and enjoy many other flowering trees and shrubs. Walled Garden - Relax in the 100 year-old Walled Garden containing the Water Garden with the original cabbage palms and tree ferns and the Terrace Garden with its stunning avenue of Chusan palms. Self-Guided Tours - Discover Logan's gems as you follow these stimulating tours at your own pace. Discovery Centre - Did you know that peat wall gardening started at Logan? Find out more about the wonders of Logan and the plant kingdom. Viewpoint - Climb up the gentle rise to the viewpoint with its spectacular outlook to Luce Bay and the Galloway Hills. Colourful Collections - One of the best Scottish collections of tender perennials including Diascias, Fuchsias and Salvias, providing a blaze of colour. 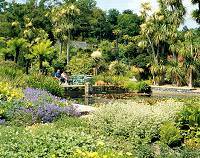 Logan Botanic Garden is a specialist garden of the Royal Botanic Garden Edinburgh. Facilities for Disabled. No animals except guide dogs. Off the B7095, 14 miles south of Stranraer in the Rhinns of Galloway. Free coach and car parking.